Common Law - Dead End Street? I have been a Solicitor since April Fools Day 1980! To be honest I was never convinced that this was the career for me. I still wonder sometimes. It all became a bit clearer when I started my first proper job at the Vauxhall Law Centre in Liverpool. This involved working mainly for tenants in, what was, then, one of the most deprived areas in Europe. I quickly became converted to the cause of Access to Justice - I genuinely wanted to fight for justice for ordinary people who were having to battle against powerful government bodies or wealthy companies including insurers. That has kept me going ever since. My first ever venture into the Court of Appeal and the Law Reports was Rimmer v Liverpool City Council  EWCA Civ 11. It wasn’t a world changing case but was a modest step forward in the rights of tenants injured due to defective premises. Legal aid was refused four times before the successful High Court Trial. A very courageous Management Committee backed the case. There were a few sleepless nights during the trial. Thankfully we got Legal Aid for the Appeal! I mention that case because this is just a modest example of how our common law has developed. Cases like this have all been small but significant pieces of the jig saw. Developing case law has been particularly effective in progressing the rights of the vulnerable and the weak; achieved partly as a result of the combination of committed lawyers and properly funded Access to Justice. I genuinely fear that recent ‘reforms’ will see this grind to a halt. Who will bring these cutting edge cases? Cases like Mr. Rimmer’s have been out of scope for years. But who would have the courage to run his case on a CFA now – especially if they will only be paid under the fixed fee regime? So who take up the fight for those who are weak? Where would we be if Mrs. Donohue’s unfortunate encounter with a snail had been subject to a CFA risk assessment? How will our proud common law continue to develop if the lawyers are forced to cherry pick those cases that will keep them in business? Are we in fact seeing the advance of common law stopped in its tracks by ‘value for money’ and ‘proportionality’? That is a real worry for us all. Are we in fact seeing the end of fighting for justice as a career choice at all? This is why the fight to save UK justice has to go on. It is more than just a commodity. I suggest that all of us, including hard working tax-payers, would agree with that. In praise of lawyers - just for a change! It is a truth universally acknowledged that lawyers get a bad press. It goes with the territory – rather like being an Estate Agent or a Politician. At one level we learn to live with it and to put up with the endless lawyer jokes. Why are all lawyers like bananas? Because they’re yellow, bent and hang round in bunches! But there can also be certain nastiness when the words ‘fat cat’, ‘ambulance chaser’ and most misleadingly of all ‘No Win. No Fee’ are used. This does make it difficult for us to campaign against attacks on Access to Justice because the spin will always be that the lawyers are just protecting their own interests. The fact that many legal aid lawyers earn no more than teachers or social workers is largely ignored. So it’s about time the world got to hear about what lawyers really do. For example my own firm has just acted pro bono for the trustees of a food bank charity in relation to a lease of some premises. I have blogged before about the scandal that food banks are needed in this century! This was just small job to support a worthy cause. Across the country hundreds of lawyers will have done something similar. It is something we all do regularly and which gets virtually no attention. Last week there were two major events in London. On Thursday 23rd May hundreds of lawyers took to the streets of London to protest against proposed ‘reforms to criminal legal aid that will leave defendants with little or no choice over who will represent them. This was not just a case of lawyers’ protecting themselves. Well known victim of injustice Gerry Conlon said - ‘Without legal aid me, the Birmingham Six and the Maguires would still be in prison.’ The second event was the London Legal Walk which saw over 7,000 lawyers and judges take part in a Charity Walk to raise money for free legal advice and assistance in the London area. The march raised over £500k. There is a series of similar walks planned over coming months. We will be walking in Liverpool on 19th September. There is a dilemma here which is similar to that facing food banks. This should not be necessary. The state should ensure that all have equal access to justice regardless of wealth. But the reality is that in the face of a government that does not listen we cannot allow the unmet need to continue. These are not ‘fat cats’. They are professionals who are genuinely worried that our justice system is being allowed to fall into decline. These events do not get great media coverage. Maybe we should shout out more about what we do! Earlier this week, I came across two interviews with the Minister of Justice, Chris Grayling. The first was the one with Catherine Baksi of the Gazette that I mentioned in my last blog. The second was a TV interview on BBC North West following the protests in Manchester by lawyers opposing the competitive tendering for criminal legal aid work. The only difference is that it won’t be funny. 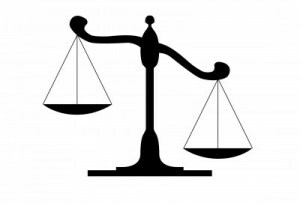 What image do we associate with justice? Scales. Things are held in balance. That image might need to change as the resources on one side become massively weighted in their favour. The state is never reluctant to spend huge sums on legal costs when it wishes. The same resources should be available for those who have to defend themselves; those who are innocent until proven guilty. And we know from many high profile cases that many are in fact innocent. Even if we ignore the obvious insult to the intelligence of many defendants; that statement is simply not true. It overlooks the assistance available to help defendants find the right lawyer. There are many advice agencies, web-sites, local law societies and elected representatives who will point a defendant in the right direction. My firm does not do criminal work of any sort. But if we receive a call from somebody requiring expert advice we know exactly which firms to recommend. Many lawyers have spent years refining their skills to enable them to offer the best possible service. Now they have to give way to the cheapest. This present controversy is about criminal law. But we are seeing the balance shifting in favour of the state in many areas. It is become almost impossible to challenge welfare benefit and immigration decisions. Even the historic right of judicial review is under threat. I fully support those who oppose these ill conceived and unfair changes and hope that the minister will listen. But I am not holding my breath. What price do we put on Justice? The government is far from finished with its cuts to legal aid. As far as Criminal Barristers are concerned he said - ‘I think most criminal legal aid lawyers in the junior bar are not particularly well paid.’ No mention of Solicitors but they’re not well paid either. The removal of choice is as surprising at it is misconceived. In most other areas this governments bangs on and on about giving people more choice. But when it comes to Access to Justice for ordinary people they change their tune completely. It is all about removal of choice altogether. The Ministry of Justice has made no secret that it will have to guarantee a certain level of work for bidders. This can only be achieved by removing a Defendant’s choice. So if someone is arrested and charged – innocent until proved guilty – they will be told who is going to be their lawyer. Whether they like it or not. There can be no stronger case for the state to fund proper legal representation, than when the state itself is bringing a prosecution against a person with the full weight of its resources behind it. To dilute that person’s choice of lawyer is a very dangerous move. I was at the Liverpool Legal Awards Dinner on Saturday and one of the winners reminded us that the present government is one which knows the price of everything and the value of nothing. You cannot put a price on justice. It is just over a month since the Government’s ban on referral fees in Personal Injury cases came into force. As we know this was driven by the insurance industry that then used the ban, and the supposed savings, to drive down fees recoverable by victims of negligence. It is fair to say that they got virtually all that they wanted. But, if recent comments from David Fisher of AXA are anything to by, they are still far from satisfied. According to the Law Society’s Gazette he is already accusing firms of flouting the ban and calling for even tighter controls suggesting that the ban – ‘did not go far enough’. If he has specific evidence of firms acting in breach of the ban then he should make it public. Anyone who simply ignores the ban deserves all they get. Most firms are saying that this is the most difficult time that they can recall after many years of practice. For a leading insurance company to come out with this type of wide sweeping statement is nothing short of an insult. The fact that the comments are made within just a few weeks of the ban suggest another agenda. How can they possibly have any reliable statistics? One suspects that they feel that they obtain even more benefits by striking quickly. After all, they have done quite well out of the changes so far. I cannot see the government or the SRA taking any action after such a short time. And I’m sure AXA know that. I fear that this is all part of winding up the rhetoric in preparation for what they want most of all – an increase in the small claims limit to £5k which would effectively wipe out access to lawyers for almost all accident victims. Tragedies, cuts, injustices and truckers - a blogger's year.. This blog hit two significant landmarks over the weekend. Firstly we reached 200 blog posts since it was started just over a year ago. Secondly we also reached 50,000 hits – so that is about 250 reads per posting, on average. From looking back over the most popular topics it is clear that certain key topics have dominated the year. The one with the most reads – with over 1000 reads was the tragic story of the young mum whose bladder cancer was missed and who sadly passed away on Good Friday. This highlighted the injustice, both of legal aid changes and also obsession in the media and government with blaming victims for a mythical compensation culture. But most of all this was real tragedy affecting a normal young family. However much lawyers and politicians might argue about what is right and what is wrong, this is a sobering reminder there are real people caught up in all of this. The blog with the second highest number of reads at just under 1000 will come as no surprise at all. This was about the dismantling of justice for ordinary people. Back in May 2012 it all seemed a long way away. Since then the picture has become even worse then we all feared. Legal Aid has disappeared for whole areas of law. Advice agencies are closing or making desperate cuts. The changes to CFAs have hit and fees for PI Claims are to be decimated. We all did what we could to oppose all of this but almost all arguments fell on stony ground. But this does not mean that the fight is abandoned. This will continue to be a dominant theme in the months and years ahead. In a surprising third place with over 700 reads is the posting about Eddie Stobart jumping on the legal bandwagon! This is certainly a sign of things to come. With the arrival of alternative Business Structures we are beginning to see competition for traditional lawyers from well known brands. I have said time and time again that we cannot ignore this development. Indeed, some competition from experienced business is no bad thing and could lead to a better deal for clients. But there are also concerns over quality especially with the well known truckers potentially bidding for Criminal Legal aid work. In fourth place is the post about APIL’s unsuccessful application for Judicial Review of the government’s cuts in relation to personal injury claims. I can still recall the tension as we all followed twitter waiting for the disappointing if not surprising outcome. This will always be a significant day for anyone doing this type of work. It was the day the game changed. Since that day a number of firms have already closed the door or decided to move away from this work. This is a real shame for victims but I have no doubt that it is exactly what the government and its friends in the insurance industry wanted. In fifth place, was a blog about the desperate situation for those training to be lawyers. This was a response to the SRA’s abolition of the minimum salary for Trainee solicitors. Some students talked of debts of just under £50,000 by the time they had finished. Training contracts are like gold and many can also now be given jobs on salaries as low as the minimum wage. This could well take us back to the days when the law was indeed a career for the rich. My fear is that best students will simply decide it is not for them and look for a career with a more secure future. So they have been the dominant themes over the last year. I was originally only planning to do this in the run up to LASPO. But the issues are just far too important. So you are going to have to put up with plenty more over the next year! I just want to follow on from Tuesday’s blog about under reporting of doctors who are guilty of repeated poor treatment. This has been followed by a report from the BBC on the frightening number of major mistakes over the last four years. These are the sort of incidents that the government say should never happen. In other words these are the most basic of mistakes. There have been over 750 such cases over the four years. And these are just the most obvious cases. When you consider the number of cases of undiagnosed fractures, missed illnesses, lost records, administrative delays etc the picture is alarming. Forgive me for labouring the point but this is nothing to do with a ‘compensation culture’. This is nothing to do with doctors being afraid to treat patients because they are afraid of being sued. This is nothing to do with practitioners refusing to try new procedures for fear of litigation. We need to disregard all of the rhetoric associated with the increasing number of claims for negligence. The reality is that the NHS needs to do all it can to eliminate these errors. We will not solve the problem by making it as difficult as possible for victims to bring claims. We need to stop the incidents happening in the first place? I suspect that most lawyers who do this work would love to see the day when they were no longer needed. That day is a long way off and will probably never arrive. But this report is all the more reason why we need to stop blaming victims and their lawyers and concentrate on remedying the real problems. The Demise of Legal Aid - is anyone decomposing?? As you know the government has removed whole areas of law from the scope of Legal Aid. This means that clients requiring advice in relation to most Family Disputes, Welfare Rights and Employment will either have to represent themselves or find the money to pay for legal assistance. At the same time a number of businesses are realising that a lot of the work traditionally done by their lawyers does not actually require legal expertise. The gathering of information and documents is something that they can do themselves. This is all leading to a new concept known as ‘unbundling’ or ‘decomposing’ of legal services. The leading advocate is Richard Susskind in his recent book – Tomorrow’s Lawyers (Oxford Press 2013). He uses a litigation claim as an example and breaks it down into 9 tasks – Document Review, Legal Research, Project Management, Litigation Support, Disclosure of Documents, Strategy, Tactics, Negotiation and Advocacy. He asks which of these are lawyers ‘uniquely’, qualified to undertake. He suggests that there are just 2 – strategy and tactics. The other tasks can be done by the clients themselves thus avoiding the expense of legal fees. Interestingly Legal Research is not a task uniquely for lawyers! So is this the way forwards? Will we soon see a radical change in the way lawyers work? Are we seeing the day when insurers will contest claimants’ legal costs saying that they could have done certain tasks themselves? On the other hand the extension of fixed fees and inevitable reduction in costs will make this idea attractive to all. Any measures which increase access to justice are to be welcomed. I can certainly see this being of great help to litigants who are forced, for various reasons, to bring or defend actions in person. I can also see it being well received by the courts as parties to a case will have professional assistance along the way. I think there are some dangers. If the lawyer is dipping in and out of a case at key stages then something might be missed. Cases do not always follow a predictable path and I can foresee arguments between solicitors and clients as to what exactly has been agreed. These problems can be addressed but I think that there will need to be careful preparation of retained agreements. This is presumably why the Law Society has published its guidelines. The world is changing by the day! This is certainly something that we all need to consider if we are not to be left behind. How often to we hear politicians and commentators going on about the so called Compensation Culture? Those two words have been used to justify the major cuts that I have gone on and on about in recent posts. One group of victims who are particularly targeted are those who are injured as a result of Medical Negligence. This is my own particular area of practice and I see case after case where patients’ lives are ruined by medical errors. Most recently I have mentioned the tragic story of a 34 year old mother of two who has died following an inexcusable delay in diagnosis of bladder cancer. It does not seem to matter that these victims are entirely innocent; they are still made to feel that they are in the wrong if they seek justice against the NHS. It is as if they are responsible for the entire funding of the health service and it might all collapse because they are seeking compensation. The lawyers who represent them normally find themselves described as ‘ambulance chasers’ or worse. But the real answer to this problem is not to blame victims or lawyers. The real onus is on the medical profession to do more to eliminate mistakes and to reduce risk. In fact the opposite seems to be the case. According to a report in the Telegraph there seems to be a systematic failure by hospitals to report failing doctors to the General Medical Council (GMC) – the body who can decide whether a practitioner is fit to practice. Of 204 doctors who had received 2 or more complaints against them, just two had been reported. This is an alarming report. We all wish to see a reduction in the number of medical accidents. There are far too many tragic stories. The answer is not to attack the victims, to make it as difficult as possible to claim. The answer is to completely review risk management policies. The starting point has to be a duty on organizations to report to the GMC. The vast majority of Medical Practitioners do a fantastic job for their patients under difficult conditions. Their job is made that much harder when colleagues make repeated mistakes and are allowed to carry on regardless. Fast Eddie turns to crime? Last year, I talked about the plans by well known truckers, Eddie Stobart, to offer the public access to barristers. Since that time the initiative has proved popular, with a number of organizations and individuals using their services, which are provided on a fixed fee basis. In November last year I heard their legal director, Trevor Howarth speak. He actually gave a convincing talk about their plans to revolutionise the way legal work is done, and paid for. It is clear that this is serious competition for traditional law firms and one which they cannot ignore. But they have driven into a controversy in relation to criminal legal aid work. The government have announced highly controversial plans for competitive tendering for contracts to do the work. Essentially it will go to those who offer to do the work at the lowest cost. The result will be a huge reduction in the number of companies who can act for defendants. This in turn will have an impact on a client’s right to choose his own lawyer. Howarth has come out with some inflammatory comments about criminal lawyers, describing them as - “very wounded animals ready to die”. I’ll come back to that in a minute. It is hard to see how this company could successfully carry out criminal work under their existing model. They offer access to barristers. There is far more to the work than that. Lawyers are regularly called out to police stations at 2.00am. 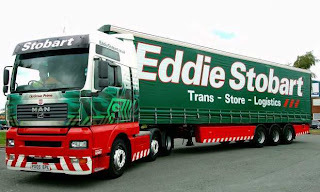 Now you might see an Eddie Stobart truck on the M6 at 2.00am but you are unlikely to see one of their barristers down at the local police station at that time of night. To get the contract they will have to offer the whole package, which is way beyond what they currently do. So is this just a publicity stunt? I don’t think they can be dismissed that easily but I wonder if they have considered the full implications. Last year I worked with a number of criminal lawyers in Liverpool who successfully fought off plans to make them attend court on Sundays. From my experience criminal lawyers are alive and well and willing to fight for their clients. Anybody who is willing to work unearthly hours for a paltry return is not going to lie down that easily. I don’t think that fast Eddie can be ignored but on this particular issue they seem to have taken a wrong turn! During my recent trip to Australia I drove about 1750 kms through Queensland. One thing that was noticeable was the straight speaking road signs such as the above. It would be very difficult to argue that you did not know that you were not supposed to go that way! ‘The Claimant was proceeding along the Bruce Highway close to Itchy Pile Creek when his car was struck from behind by the claimants Camper Van’. We are now one month into the new post Jackson world. The sky has not fallen but we are already hearing of firms who have closed or are intending to close or to make major cuts in response to the devastating reductions to the legal costs that victims can recover from insurers and the scrapping of legal aid for most cases. Recent comments from Minister Helen Grant are far from encouraging. In a recent statement she acknowledges a period of uncertainty and ‘some pain’ which must break some sort of record for understatement! She also talks about her own experience in practice saying that she became increasingly worried about a ‘compensation culture’. Anybody in practice knows that this so called culture is a myth. One does wonder on which planet she practised law. But none of this means that we give up. Anybody representing victims must keep up the volume and bring examples of injustice to the ears of anyone who will listen. One hope is that ordinary people will be more concerned about the changes once they experience their impact. Many have predicted chaos in the courts with unrepresented parties clogging up the system. Politicians themselves are likely to see more constituents at their surgeries and have nowhere to send them. But the biggest argument in relation to motor claims will be over the much vaunted reduction in premiums. Nobody expects to see them or if they do they are likely to be no more than about 2 or 3%. Hopefully the changes will be seen for what they are – a government offering the heads of victims on a plate to their friends and supporters in the insurance industry.